With the development of the automation industry, the application of machine vision technology has been extensive growing. For example, in the automated manufacturing industry, machine vision measure and inspect various dimensional parameters of the accessory parts, such as length measurement, circle measurement, angle measurement, arc measurement, area measurement, etc.. It can not only obtain the size parameters of the online product, but also commonly applied in products that are made online for real-time determination and sorting. The inspection system that based on machine vision technology has the advantages of low cost, high precision and easy installation. Coupled with powerful visual software, easy to adjust, flexible and convenient, and measurement data can be stored, easy to establish statistical analysis, easy to quickly find problems, solve problems, the inspection system is the best choice for industry testing technology. Many customers choose CMOS cameras for cost considerations. When shooting the edges of objects, the contrast of edge contours is poorer, and the noise is larger, which brings large errors for software measurement. It is usually recommended to use CCD cameras. Many mechanical parts have height difference and a large depth of field (DOF). However, due to the viewing angle factor, the ordinary lens is difficult to capture the inner wall of the component, which makes it difficult to find the most realistic and accurate edge contour during software processing, and puts higher requirements on the image processing algorithm. Many customers will choose an ordinary backlight. When the visual inspection accuracy is not high, the backlight has a price advantage. Under the premise of high requirements, the principle of the backlight is to use light to produce uniform and soft light through the diffuse reflector, and the light generated at a certain point will diverge at any angle to the space. When detecting a circular or cylindrical object, diffraction occurs at the edge of the object to be measured. At the same time, the brightness of the light source also has a great influence on the brightness and darkness in the image. 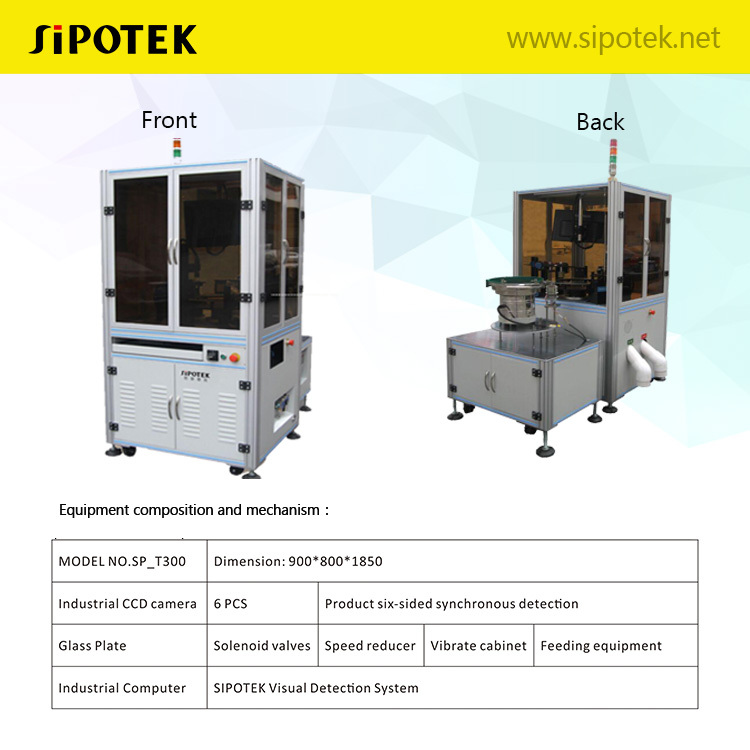 Visit https://www.sipotek.net/ for more information about CCD camera inspection machine application. Machine Vision Systems Manufacturers Tell You About What Are The Classifications Of Machine Vision Inspection Equipment?